In a dark, cavernous underground sound stage, two women crouch, their eyes riveted to a giant movie screen. Projected in front of them, frame by frame, is the final cut of Star Wars: Episode I. Like musicians in an orchestra pit playing to a celluloid score, they take their cues from the movements of the images flickering in front of them. The duo of performers creates a sound to match the movement onscreen wielding mysterious metallic instruments. 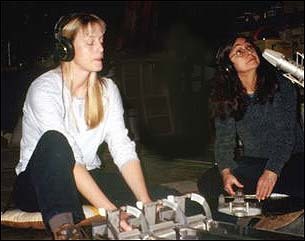 Highly sensitive microphones record the specialized work of these two women. Lithe and highly focused, Dennie Thorpe and Jana Vance are the foley artists of Lucasfilm. Together with their partners, Foley Recordist Frank "Pepe" Merel and Foley Mixer Tony Eckert, they provide the ambient sound effects of Episode I. These subtle yet essential foley effects - the footsteps, the cape movements, the rattle and hum of everyday life - provide all of the natural sounds that exist between the remaining layers of sound in a film. Many films utilize a foley track because sound as recorded on the set is often unusable. Background noise like a plane flying overhead or the toot of an automobile horn can obscure dialogue. 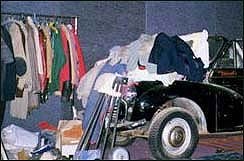 Sometimes live sound recorded on a set must be replaced because sets created to look like real environments are actually fake. For example, when Ewan McGregor (Obi-Wan Kenobi) and Liam Neeson (Qui-Gon Jinn) faced Ray Park (Darth Maul) in Episode I's climactic lightsaber battle, they were actually performing on a set constructed of plywood made to look like metal. The live sounds recorded during this scene consisted of a series of heavy footsteps on plywood, the clack of prop lightsabers and the breathing of the actors as they performed the complicated fight choreographed by Stunt Coordinator Nick Gillard. To create the necessary illusion of realistic sound, Dennie and Jana recreated the scene foley-style by running, jumping and occasionally falling on a special square of marble "spaceship" surface. The other sounds, like the lightsabers and doors opening and closing, were created by Ben Burtt and his sound editing team. 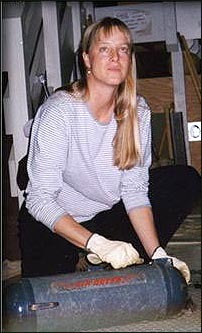 The Episode I foley team has worked together for over three years, though Dennie has been part of the Lucasfilm foley team since she walked in both Darth Vader's and Luke Skywalker's footsteps in Return of the Jedi. "It was my third or fourth job and I was scared to death," says Dennie, "because I was doing it by myself. Yet it was fun." The well-knit team works closely with Sound Designer Ben Burtt. At the beginning of Episode I production, the foley team and Burtt watched an early cut of the entire film. They made a scene-by-scene analysis to determine which foley effects were needed. 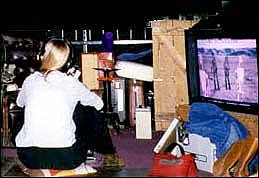 After foley work for each 10-minute reel was completed, Burtt returned to the foley stage to evaluate a playback. The group then discussed the sounds and determined what needed to be altered, enhanced or simply redone. Each day the busy team created approximately 200 different "sound events," which are unedited recordings that will eventually be crafted into finished sound effects. Their huge sound stage is full of real-life objects - ancient vacuum cleaner canisters, the battered hood of a car, a mini-swimming pool, and cabinets of stuff that most would be hard put to identify. "Very low tech stuff sounds great when used in creative ways," says Jana. Yet, though the foley cupboards were packed, the team decided that they would need a set of truly unusual sounds for the production of Episode I. "Often," says Tony Eckert, "the real movement doesn't sound as real as you'd want it to and the artist must find a more suitable object with which to create the sound."